A tale of a mistake—really, an honest mistake—and how to make amends, which includes read-aloud scream-alongs. Three of them. Little Penguin has just demolished a delicious lollipop when sea gull friend Kenneth points out that it was his lollipop—it says it right there, on the bucket that the lollipop was propped in—and Kenneth is not amused. So Little Penguin tries to cheer Kenneth up: apologies, a hug, an “ ‘I’m sorry’ card.” No luck. Now Little Penguin beseeches readers to help. Together they will make funny faces and on the count of three, shout “RAZZLE-DAZZLE LOLLIPOP!” three times, at greater and greater volume. There is nothing quite like screaming at a storytime, but Bentley’s artwork holds nearly as much appeal, with a soft palette and wacky scenes of penguins in waterski-team pyramids and flying biplanes with great trailing banners. 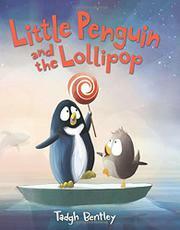 Little Penguin tips over the floe on the last scream, amazingly finds another lollipop down on the ocean floor, propped in a bucket, and returns with it for Kenneth. Of course, Little Penguin doesn’t read the name on the bucket. It’s Franklin, and not to give the story away, but Franklin is a very large creature whose name begins with an o, ends with an a, and has two letters between.